Sleeping less would seem to help you lose weight because, when awake you burn more calories than when you are asleep. This should apply whether you voluntarily choose to sleep less or your sleep is very disturbed or you have sleep apnea. However, recent research has shown the opposite. Getting a good night's sleep helps when people are trying to lose weight. People who are deprived of sleep do burn more calories, but this is more than offset by eating more, and eating the wrong types of food for the wrong reasons. Tired and stressed people tend to eat for comfort, or to relieve stress not because they are hungry. Also sleep deprivation has been shown to induce major changes in fat metabolism that contributes to weight gain. Do Night-Owls Who Sleep Less Burn More Calories? Studies have shown that people who only sleep five hours a night burned an extra 110 calories per day. This is equivalent to about one quarter of a regular size meal. Do Night-Owls Who Sleep Less Eat More Food? Energy intake (calories consumed) was much greater, especially late at night, well after dinner. The extra energy intake is well in excess of what was needed for the extra calories burnt by sleeping less. 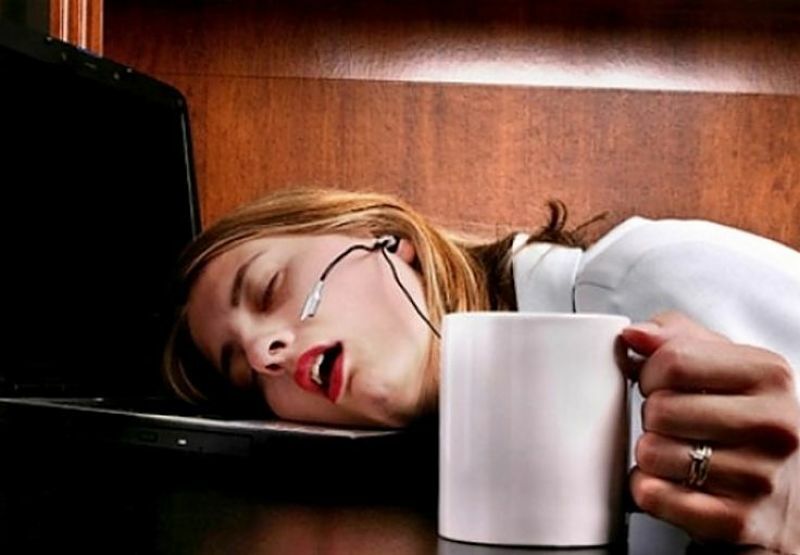 Sleep deprived people may be less active and less inclined to exercise as well. Studies showed that when food was readily available, food intake surpasses what was needed. Night-owls may eat not to overcome hunger but because they are stressed. Do Night-Owls Who Sleep Less Gain Weight? Scientists from the University of Colorado studies eight changes of 16 healthy women and men over a two-week periods of strictly controlled conditions. During week one, 8 of the subjects were allowed to sleep 9 hours and the other eight only 5 hours. Each group was given access to plentiful food that as not restricted. During the second week the two groups swapped sleeping patterns with the night-owls swapping to 9 hours of sleep and vice versa. Over the course of the study, both groups that had only 5 hours sleep gained an average of about 1 kg (2 pounds). The sleep deprived subjects ate far more and gained weight. Does Sleeping Less Change the Type of Food Eaten? Once again the answer to this is: "Yes!" In the study there was always plenty of food available and the food eaten was carefully monitored. The Night-Owls ate far more carbohydrates. They had tiny breakfasts and huge quantities of snacks late at night, after dinner. The Night-Owls ate an average of about 10% more calories when sleeping only 5 hours a night. Were the Changes in Diet and Meals Reversible? Once the Night-Owls swapped to sleeping longer they resumed their healthier eating habits and started to lose the extra weight. The researchers also found that lack of sleep also changed the person’s internal clock and this affected their eating and sleeping patterns. Do Children and Adolescents Who Sleep Less also Gain Weight? Other studies have shown that children who sleep less than 10 hours a night gained weight. A study of more than 8,000 British children who were monitored from birth, found that those who slept less that 10 hours a night,when aged 3 years, had about a 50% greater risk of becoming obese by the age of 7 years. A study of almost 1000 American children, found that those that slept for less than 12 hours a night had twice the risk of being obese at 3 years of age. 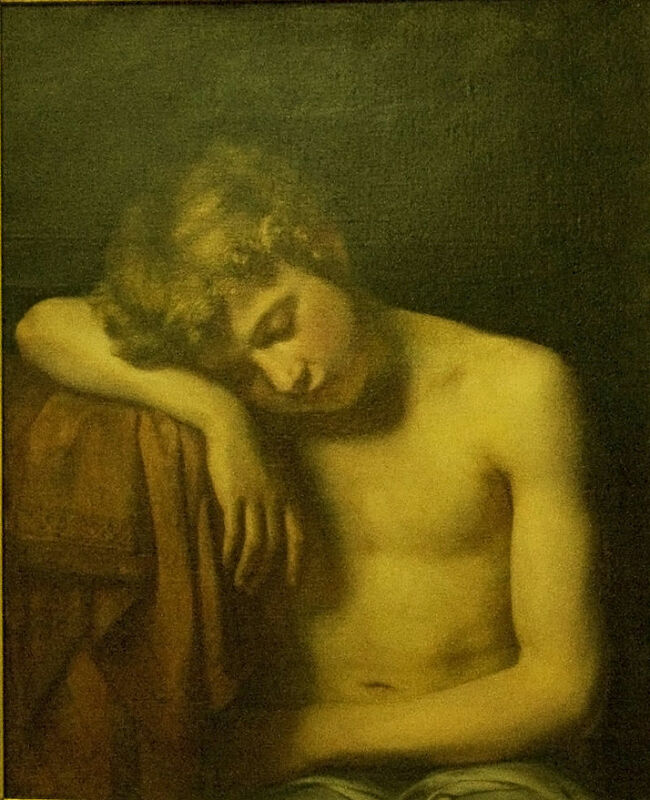 A New Zealand study of more than 1000 children, from birth until age 32, found long term effects of sleep deprivation. The study found that lack of normal sleep duration during childhood (3- 9 years) increased the risk of obesity at age 32 by 50%. Do Other Studies Confirm the Conclusions that Sleep Deprivation leads to Weight Gain? For adults the results of various studies have shown similar results. A major study of 68,000 middle-age American women for 16 years, showed that women who slept less than 7 hours a night were 15 % more likely to become obese over the course of the study. How Does Sleep Deprivation Cause Weight Gain? Poor Diets - As outlined above sleeping less leads to eating more carbohydrate snacks and other foods late at night. Sleep deprived people have less healthy diets. 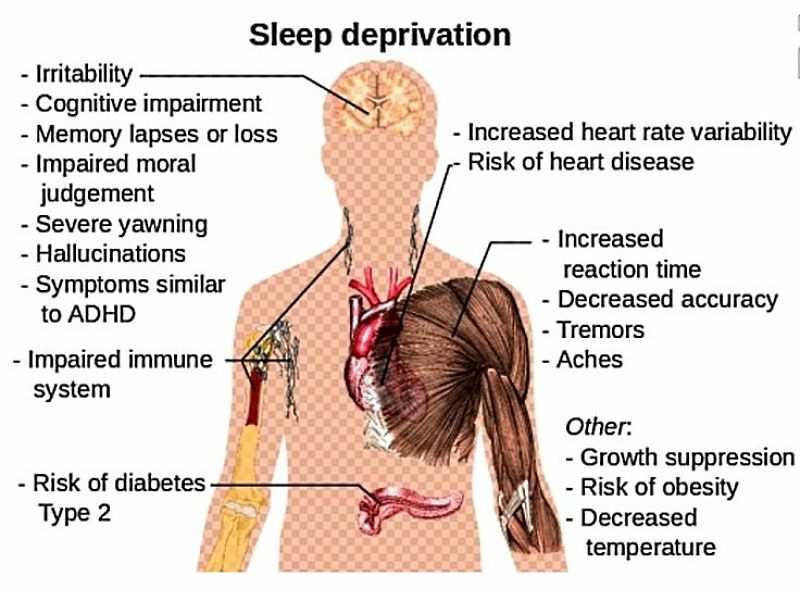 Increases in Hunger - There are suggestions that sleep deprivation may affect the hormones that trigger hunger. Changes in Fat Metabolism - Sleep deprivation has been shown to make the fat cells less sensitive to insulin. These metabolic changes are associated with both obesity and diabetes. Reduced Physical Activity - People who sleep less tend to be exhausted during the day and late afternoon and show no enthusiasm for exercise. Lowering the body temperature - In various studies, sleep-deprived people tend to have slightly lower temperatures which may lead to decreased energy expenditure. Results of various studies show that people with sleep apnea tend to have a higher BMI and they gained weight over time due to lack of proper and adequate sleep. 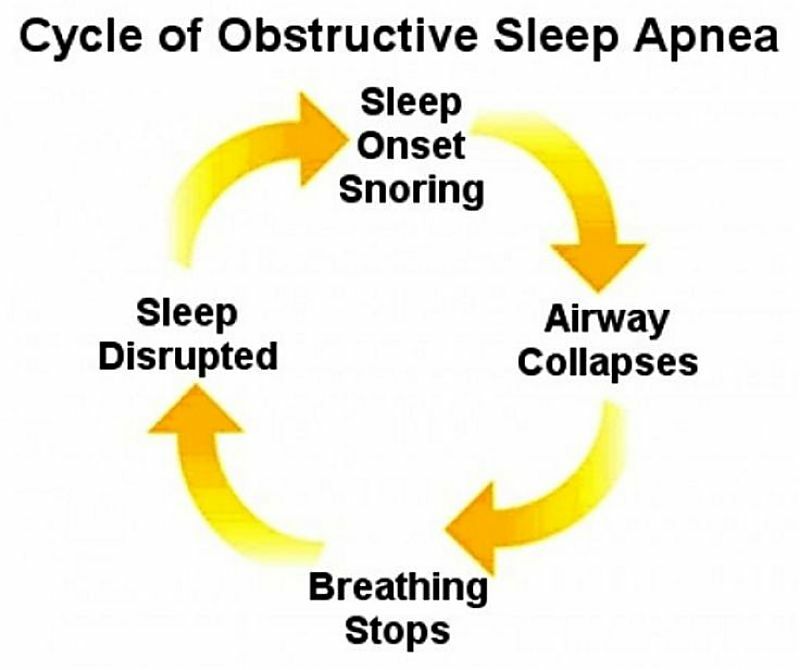 The apnea ruins the qualify ogf their sleep as well. Increased food intake by sleep deprived people appears to be a physiological and behavioural adaptation to provide extra energy to keep awake longer and to provide 'comfort'. It is clear that sleep plays a key role in energy metabolism in many ways and the amount of sleep contributes to the risk of weight gain and obesity.